Whatever newspaper you choose to pick up, it will always have the following sections: the important front page news regardless of their genre, the political section, the sports section, the fashion section, the ads section, and hopefully, your own productions. 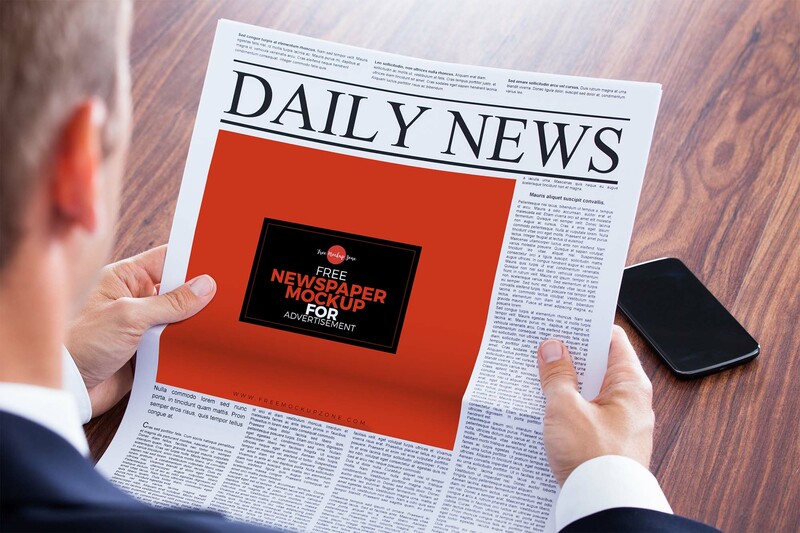 And that’s why we’re more than excited to share with you this free newspaper mockup. Presented by Free Mockup Zone, the mockup provides a highly realistic look thanks to its design. It showcases a man holding a newspaper in his hands with a wooden desk/ table and a phone in front of him. These elements on their own are a work of art, so imagine what will happen once you add your designs. Any advertisement or announcement can be easily added and edited using the smart object layers. And when designing, keep in mind that the resolution of this PSD mockup is 2700×1800 pixels and that the format of the file is 7-zip.